Among other perks, guided bike rides succeed in lifting the headache of dealing with your own logistics when dropping into an unfamiliar place. While it’s true that all you need to do is show up, a guided ride may just be a passive metaphor for suffering if you take it at face value. But calling a guided ride an “experience” or an “adventure” seems a bit too giddy with marketing jargon so we’ve taken a page out of Washington Irving’s book “Tales of the Alhambra” to downplay the typical “guided ride” in favor of sparking your creativity to “ride” your tale. What does that mean? “Ride” Your Tale? There’s a reason why the Alhambra palace is the color of sand and is perched just above modern day Granada, do you know what it is? Or, when one ponders Iberian Spain’s highest peaks, why do the Pyrenees to the north seem to be the imagination’s first stop and not the Sierra Nevadas? Here’s an easy one, what’s the practical purpose for the Albaizin’s labyrinthine layout? One of the lesser-known benefits of mountain biking or gravel riding is that the varied, sometimes unpredictable riding surface has a clever way of drawing your attention away from pedaling while you ambitiously seek to tame the terrain. In similar fashion, using the bike to cover distances between attractions shifts focus away from riding and places it on reaching a series of destination to see, hear, touch, drink, or eat what’s there. You’re more likely to reminisce about something if the experience was a good one. 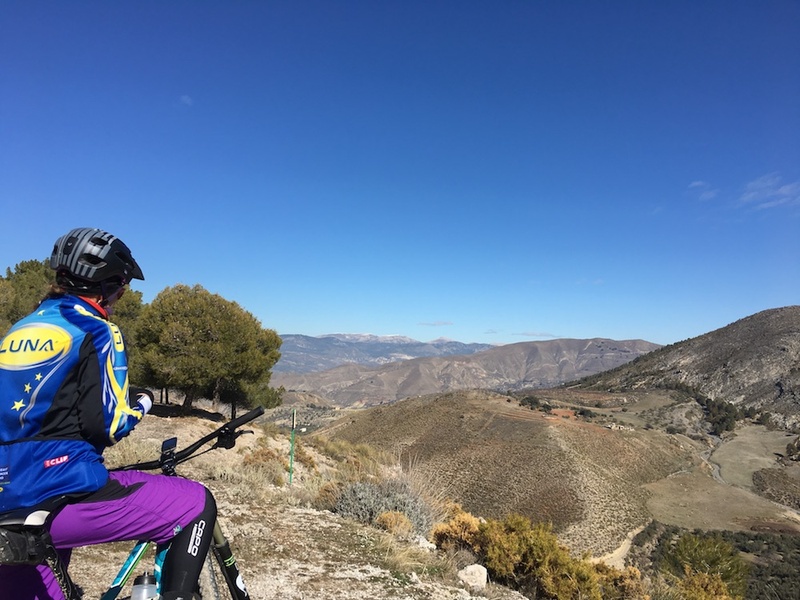 Not everyone is a pro bike rider (nor aspires to be one) but most people can ride a bike, which opens up new opportunities to see Granada and unleashes the creative process. In addition to offering a safe and enjoyable ride experience, our role is to guide this process by finding and vetting rides that optimize Granada’s natural and manmade features. The element of the unknown is what fascinates us and compels us to explore in ways that are inline with our level of comfort. Riding a bike is a form of self-expression so it makes sense to offer options that are compatible with individual preferences. To achieve this, we designed three 1-day trips, one 3-day trip, and one 5-day trip that serve up mountain bike, gravel bike, and road bike rides. 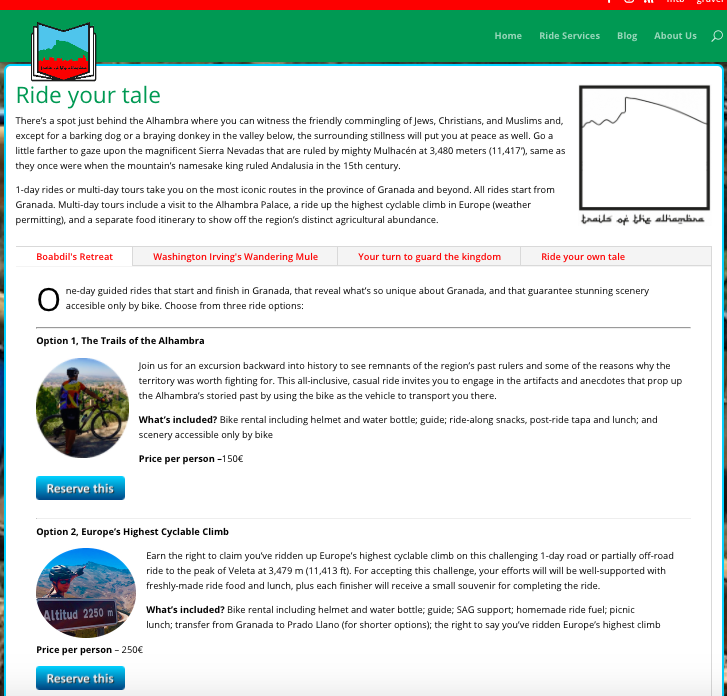 We also invite you to “Ride Your Own Tale” with an option to customize a bike trip to your specific criteria. 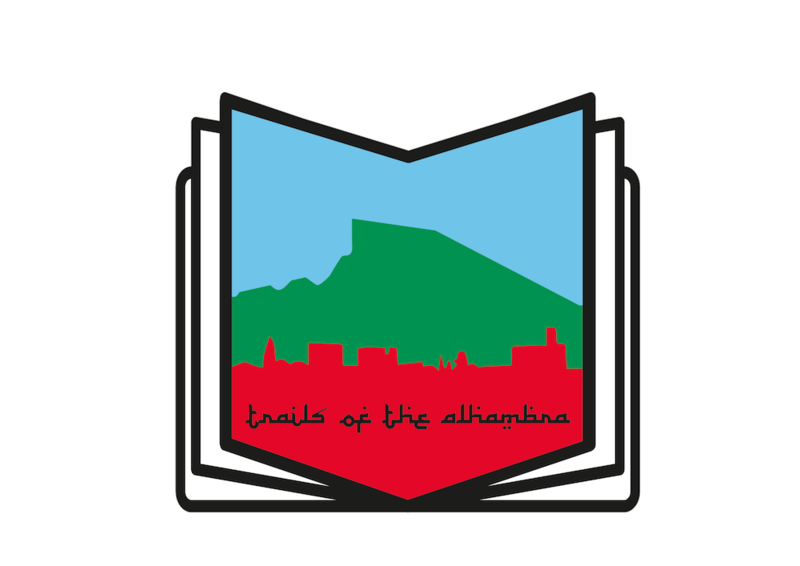 Considerations that went into designing these itineraries include: optimal scenery, route quality (surface conditions, easy access, and low or zero traffic), the best quality food available, and events oriented around Granada’s unique features. For detailed information about each ride, please visit “Guided Rides” page. 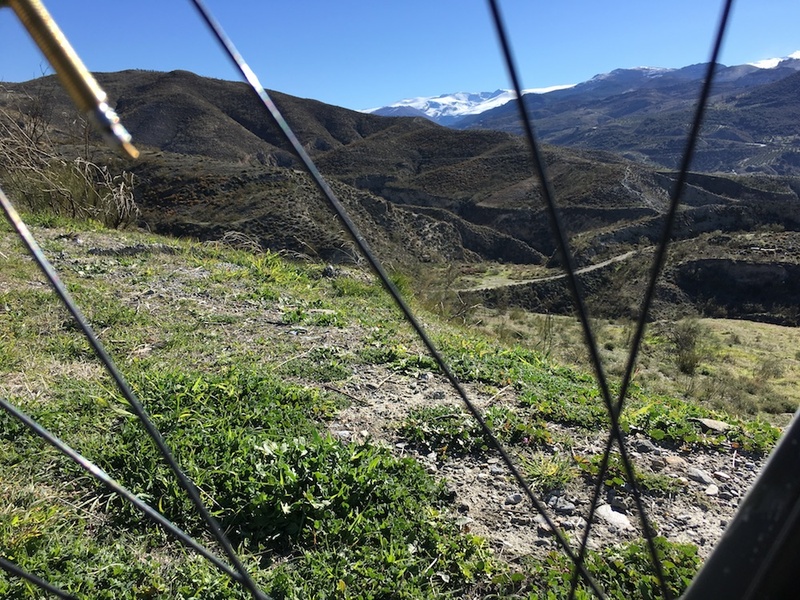 Each of these tours takes you on the most iconic cycling routes in the province of Granada. All rides start from Granada. 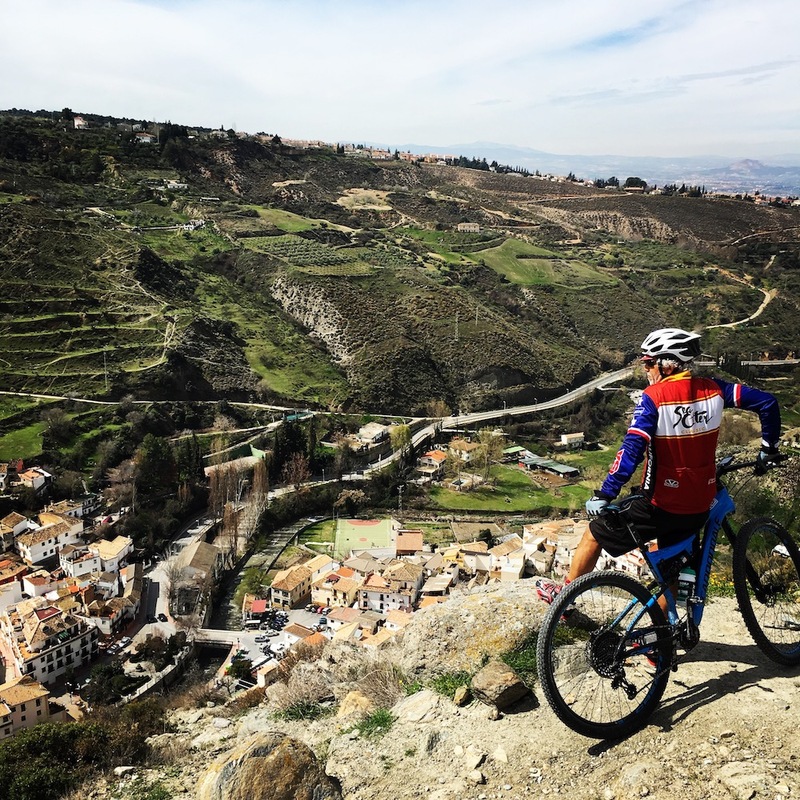 Multi-day tours include a visit to the Alhambra Palace, a ride up the highest cyclable climb in Europe (weather permitting), and a separate food itinerary to show off the region’s distinct agricultural abundance.